Edward Morgan Forster was an English author best known for his writings concerning the early 20th century working class of Great Britains. Forster was born to a middle-class family in London and attended a prestigious public school before studying at Kings College of Cambridge University. Forsters writing is known for its sympathetic nature and that could be seen well throughout his life as he volunteered for the International Red Cross during World War I. In his later years Forster became a well known public figure, first as a broadcaster on BBC radio and then as an honorary fellow of Kings College. 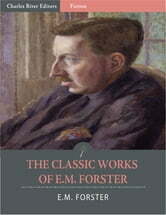 Some of Forsters best known novels are Howards End, A Room with a View, and A Passage to India. This edition of The Classic Works is specially formatted with a Table of Contents and includes illustrations of Forsters life.